Among the factors that contributed to the result of the Brexit referendum, I wish to highlight two in particular – questions of economic policy and questions of immigration policy. The articulation between these two elements continues to be one of the main sticking points in the post-Brexit negotiations, where we see the British government struggling to separate out the principle of the free movement of goods from that of the free movement of people. The economic strand of Brexit could be traced to the financial crisis of 2008 and the ensuing government bail-out of the banking institutions. The wholesale socialization of loss following decades of privatization of profit constitutes a fairly blatant rupture of whatever social contract is supposed to be intrinsic to capitalism as a political model. One legacy of the financial crisis has been the doctrine of austerity, aptly described as a political choice dressed up as economic necessity. Austerity also entails a displacement between the financial and the social spheres, as we see the cost of the banking bail-out being recuperated in cuts to public services, education and health. It just happens that the decade of austerity following the financial crisis has coincided with the rise to prominence of the discourse around immigration. 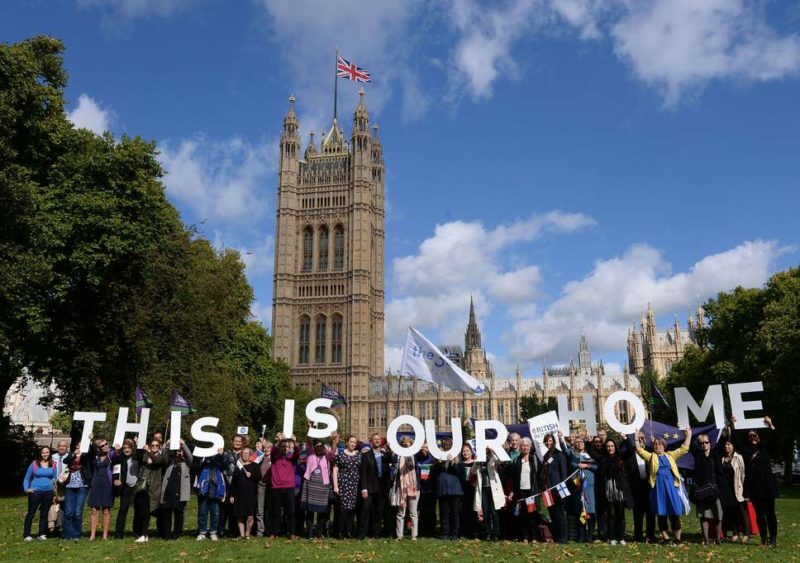 Whatever other factors might be involved in the rise of this discourse, we have certainly seen fears about immigration cultivated in political circles as a convenient means of deflection from the logic of austerity. This discourse seeks to link the concrete effects of austerity on the quality of life to the rise of immigration. Blaming immigrants for the scarcity of resources, the familiar refrain that they have stolen our jobs and are given preferential access to housing and healthcare, undoubtedly has a certain plausibility at the level of daily experience. What we would need to examine in more detail, however, is the point of intersection where a political discourse of false attribution meets up with subjective effects of willing assent, in some kind of ‘want to believe’ among the population at large. It is here that a psychoanalytic reading of the subjective roots of xenophobia and racism would help us to grasp that these subjective effects are themselves indexed on a discourse of false attribution. I attribute to the Other an alien jouissance that inhabits me, but whose nature, source and location I fail to recognize. I then hate and persecute various incarnations of this Other as being to blame for this jouissance that I am unable to assimilate, to master or to expel. Rather than pursuing this aspect of the question, so ably exposed in recent works by Jacques-Alain Miller, Eric Laurent and others, what I want to do today is to bring your attention to a particular aspect of the political discourse on immigration expressly formulated by the British government under the name of the Hostile Environment policy. This policy can be quite concretely traced in the series of dates leading from the financial crisis in 2008 to the setting of a target for the reduction of immigration by David Cameron in 2010 to the announcement of the Hostile Environment policy in 2012 by the Home Secretary at the time, a certain Theresa May. This policy was then enacted in the Immigration Act of 2014 and its successor of 2016, the year in which the Brexit referendum was held. Given the limited time available to me, I can only try to sketch some of the parameters of the discourse at stake in this new policy on immigration that we see being elaborated in the course of these years by the government that until very recently had a reputation as the bastion of Western parliamentary democracy. We should start from the gap, the disconnect between the formulation of political objectives such as targets for the reduction of immigration and the way those objectives are then played out at the level of policy implementation. This would allow us to trace some of the effects of displacement between the political, the administrative and the social registers as this policy infiltrates other levels of the social body. In the first instance, the new legislation entails a reworking of the relation between the judicial and the bureaucratic approaches to the question of immigration, effectively collapsing the legal into the administrative domain. As index of this shift we could take the removal of the claimant’s right of appeal to a tribunal, replacing it with an administrative review by the same office that had made the original decision. The shift of emphasis from legal to bureaucratic decision-making processes at the same time entails an inversion of the relation between guilt and innocence when it comes to the right to reside in the country. The burden of proof is now placed on the appellant to provide documentary evidence of their history of residence and of their right to remain. This culminated in what came to be known as the ‘deport first, appeal later’ approach, under which any appellant with gaps or errors in the required documentation found themselves liable to immediate deportation even before their appeal could be heard. The Immigration Act of 2014 also introduced new legal obligations to a range of social institutions such as hospitals, universities, employers and landlords to vet the residence status of those they came into contact with, effectively sub-contracting the function of immigration control to various social agencies. This devolution entails an effacement of the very distinction on which border control is predicated, the distinction between inside and outside. A policy indexed on a principle of strong borders, designed to keep people out at the point of entry, modulates into a continuous process of monitoring and policing on the interior of the social body. Since the Home Office was seen to lack both the legal and economic resources to locate and deport those without valid right to remain in the country, the Hostile Environment policy created the conditions for a process of constant harassment ultimately designed to produce an effect of self-selection amongst the immigrant community. Through a combination of economic incentives and practical disincentives it was hoped that those without right to remain could be encouraged to turn themselves in for voluntary repatriation. Hence such notorious innovations as the ‘Go Home’ vans driven through communities with a high immigrant population. Perhaps predictably, this policy has also served as an encouragement for private citizens to take the law into their own hands. Given that illegal immigrants bear no visible mark, no defining attribute that would distinguish them from legal immigrants, or even from those born in the country, this policy has opened the door to the worst kinds of xenophobic behavior towards any visible marks of difference or discrimination, as witnessed by the dramatic increase in hate crimes since the Brexit referendum. If the Brexit fantasy were in fact to achieve the sealing of external borders against undesirable outsiders, at the cost of withdrawal from the European Union, we can see that the conditions are already in place to unleash an even more vicious and unlimited process of hunting out impurities on the interior of the social body. We thus find ourselves sliding from a policy of keeping them out to one of kicking them out, only to arrive very quickly at a process of hunting them out wherever they may or may not be found. Some further co-ordinates of these questions, in particular in relation to the blurring of the boundaries between inside and outside, could be extracted by examining the parallel between the principles at stake in the elaboration of the Hostile Environment policy and those involved in the Benefits Sanction Regime introduced by government in the same year, 2012, as part of the reform of the welfare system within the country. Here we see many of the same policy responses devised in relation to unwelcome outsiders being deployed against citizens within the country who might have thought that they had every right to be protected by their own government. But in this reworking of the relation between rights, privileges and sanctions, certain citizen rights that we had assumed as granted turn out to be privileges that can be withdrawn under administrative sanction. If we were to follow out in more detail some of the questions at stake in this process of the stripping out of rights from the citizen body, we would find that between the attack on the rights of immigrants to live in the country and the withdrawal of the rights of citizens to social security we are not all that many steps away from the putting into question of the right to live per se. I think we have every right to be concerned about what comes next. I owe many of the main themes of this text to the excellent article by William Davies entitled ‘Weaponising Paperwork’, which can be found in the London Review of Books issue of 10th May 2018. Presentation to the European Forum, Brussels, 1 December 2018 “Discourses That Kill”. Meeting organised under the auspices of ZADIG in Belgium, by the Ecole de la Cause Freudienne, New Lacanian School, EuroFederation of Psychoanalysis, and the RIS of the University St Louis, Brussels.